The Los Angeles Kings have become the perennial cup contender their fan base has long dreamed of by winning Lord Stanley’s trophy two of the past three years while having a core of players both in their prime and under contract for the foreseeable future. Dean has become a cap magician who is now emulated by other franchises. He has an uncanny ability to target players who possess “team first” DNA coupled with on-ice success. Yet, under the new cap of $69 million for the 2014-15 season, Lombardi has put together a complete 23 player roster signed at $68,791,894 1 with other teams like Chicago, mulling over tough decisions in order to balance their budget. The Kings stand pat with nearly all of their 2013-14 teams returning to defend their title. They have core players such as Dustin Brown, Drew Doughty, Mike Richards and Jeff Carter locked up well through the latter part of the decade and last year’s spring addition of Marian Gaborik, has blossomed in to a 7-year cap friendly $4.875M. Gaborik could have signed with other teams for bigger money but his chemistry with Anze Kopitar and his belief in the organization’s dedication to each other boasts that the Los Angeles Kings possesses the aptitude for continued success. Though the path to Jeff Carter and the LA Kings first Stanley Cup Championship in 2012 had exalted such dominance; the journey of the 2014 Los Angeles Kings was a living testimonial of how perseverance and mental toughness are the bone and marrow of professional sports. Their resiliency forged broken and bruised bones into Stanley Cup silver. They were the first team in NHL history to win three playoff games 7’s on the road. They were crowned the ”Kings of California” by resurrection from an 0-3 series deficit against the San Jose Sharks- a fete only done by 3 other teams in NHL history- and by ousting the Anaheim Ducks in a 7-game display of back-and-forth offense. Despite trailing 3-times, they took their prior playoffs season redemption against the Chicago Blackhawks by beating them in a thrilling overtime game 7. In the Stanley Cup Final, they closed out 3 of their 4 wins in overtime against, all-world goaltender, Henrik Lundqvist and the New York Rangers, to again, ascend to their throne. So what does that mean for the expectations of the 2014-15 Los Angeles Kings? The expectation is not a secret. The Kings must defend their crown and become the first team in the cap era to win back-to-back championships. Unless you count them as back to back FULL-season Champions (get your shirt via royalhalf.com). There is no doubt that the Kings have proven that they are a franchise built for playoff success. However, during the regular season, inconsistencies in play and scoring prowess are areas the Kings will want to improve on. In the past three seasons, the Kings have finished 26th (2013-14), 10th (2013) and 29th (2011-12) in goals-for amongst 30 NHL teams. The re-emergence of Jeff Carter (27G, 23A) and the addition of Marian Gaborik bolster an already fearless offense of Anze Kopitar, Dustin Brown, Justin Williams, Mike Richards, Trevor Lewis, Dwight King and their two budding rookies, Tyler Toffoli and Tanner Pearson. It’s hard to predict that adding a single player will nourish their regular season scoring drought, but despite sparse scoring how do they still manage to make the playoffs and bring two championships to the city of Los Angeles? What gives, or better yet, what doesn’t give? The reigning Jennings Trophy winners are a stingy team. Last year they allowed the league’s lowest average of 2.05 goals against per game. Drew Doughty, Jake Muzzin, Slava Voynov, Matt Greene, Robyn Regehr (if healthy) and, LA Kings Stanley Cup goal clincher, Alec Martinez, account for their defense. The loss of veteran blueliner, Willie Mitchell, to cap space and ultimately free agency, is a point of interest or concern, depending on how you want to interpret it. Mitchell’s absence may provide the opportunity for young talent like 6’4 Brayden McNabb to crack the roster, or allow the Kings to option other players with more NHL experience such as Jeff Schultz (re-signed) to fill in for Regehr or in back to back game situations. The play of goaltender, Jonathan Quick, never ceases to amaze. Though his numbers in 2013-14 (2.07GAA, .915sv %) found him 14th in the league, there is no doubt that the confidence he has in the team in front of him is shared by his teammates. (Reminisce about unbelievable saves from 2013-14 NHL here courtesy of KingsVision). Martin Jones showed that he is more than capable to back up Jon Quick, with his 7-game winning streak and .934sv% and 1.81 GAA in 19 games played. Finally, at the helm as head coach Darryl Sutter with returning assistant coaches John Stevens, Davis Payne, and goaltending coach, Bill Ranford. Multiple NHL teams inquired about John Stevens for a head coaching position, yet he decided to stay in LA. The belief in the system in place in Los Angeles has everybody drinking the water. It’s not a matter of luck or fortune. It’s about attitude and commitment. I’m reminded of a quote from Darryl Sutter from 2012 when asked by a reporter whether the LA Kings were a team of ‘destiny’, where he replied, “What’s that?” The coach makes no excuses for what he sees transpire on the ice. In 2014-15, who knows what records will be broken, which players will become legends or if the Kings will hoist Lord Stanley even that much higher. I do know that with this Kings team, you have to expect the unexpected and that is another piece of their history, their armor. The Kings season begins October 8, 2014, where they will raise their second banner and simultaneously pour salt in the open wound of the San Jose Sharks. Save up to 50% on LA Kings Tickets from Barry’s Tickets. Good on tickets marked BV some restrictions may apply. Value of discount can depend on the game and seats. You can purchase 2014-2015 LA Kings Tickets for all games at Staples Center. Open 7 days a week, 9 am – 9 pm, for pickups. After a third consecutive victory the Los Angeles Kings are on the brink of accomplishing what only eight other NHL teams have done, coming back from a 3-0 deficit to win a seven-game NHL playoff series. Justin Williams scored twice to propel the Kings to a 4-1 victory over the visiting San Jose Sharks, evening the opening round NHL playoff series at three, and setting up a highly anticipated game seven on Wednesday night. The two teams will play a seventh game in a playoff series for the third time in four seasons in one of the best playoff rivalries in recent history. Tied at one heading into the third period Williams scored his second goal of the game at the 11:56 mark. Williams was able to knock home a loose puck that wasn’t quite controlled by Sharks goaltender Alex Stalock, much to the chagrin of Sharks head coach Todd McLellan. The Sharks head coach thought Stalock, making his first start in the series, had sufficiently controlled the puck. In a comment indicative of how desperate things have become for San Jose McLellan said after the game that “We (Sharks) got cheated”. The two teams were deadlocked in a tight 1-1 battle at the time. Replays were inconclusive but did indicate that the puck wasn’t completely controlled. Trying to corral the puck as it slipped behind Stalock, Sharks defender Matt Irwin may have accidentally knocked it in. The decision to start Stalock was predicated by the poor play of Sharks goaltender Antti Niemi. After solid play in the first three games of the season the playoff inconsistency that Niemi has shown in years past, especially against the Kings, returned at the worst time possible. Stalock kept it close, but after the Williams go ahead goal the Kings were able to blow the contest open. As many predicted goaltending is becoming a story in the series. After a slow start in the first three games Kings goaltender Jonathan Quick is proving once again that he’s one of the elite netminders in the NHL. Quick has allowed just one goal in the last two games of the series, won by Los Angeles with a combined 7-1 score. After Williams scored his second goal of the game to give the Kings the lead for good, Anze Kopitar scored two goals in a one minute and fifteen seconds span to put the game away for good. Kopitar notched his second and third goals of the series and has now scored in all six games of the series. Kopitar provided the assist on Williams’ second goal, giving the Kings captain three points. Drew Doughty added two assists for Los Angeles. The Sharks played without top defender Marc-Edouard Vlasic, out with an upper body injury. Vlasic’s availability will be a big question mark as the two teams head into game seven. Who Todd McLellan plays in net will also be a big factor. Stalock is an unproven playoff performer with just 27 regular season appearances under his belt. The decision to stay with Stalock or go back to Niemi will be a big storyline as the series moves into its final game. Game seven is Wednesday night at the Shark Tank in San Jose. The winner will move on to the second round to face the Anaheim Ducks. Fans in attendance will receive a San Jose Sharks promotional schedule gift for all games at the SAP Center. Don’t miss any of the action! LA Kings Tickets for all playoff games on sale now. Gary Bettman and Donald Fehr have made their peace, the embarrassing lockout is over and hockey is finally back. The NHL will now squeeze a forty-eight games season and a complete playoffs into the next six months. The Kings, who barely squeaked into the postseason and then went on a dominant run to win their first Stanley Cup are uniquely positioned for a quick start. This truncated season will reward teams that can start quickly. They’ll be no preseason games so teams that return the core of their roster from the previous year should be strongly positioned to get out of the gates quickly. Of course repeating as Stanley Cup Champion is harder than winning it in the first place, at least in the modern and more parity-filled NHL. The days of the Edmonton Oilers and Pittsburgh Penguins winning multiple titles in a row are long gone, with the Detroit Red Wings being the last to repeat nearly fifteen years ago. The Kings will also have the clichéd target on their back as they go from plucky eighth seed getting hot at the right time to defending champion. Still the entire core returns from last season save the retirement of role player Ethan Moreau, so the Kings should be primed for a quick start. Here’s a rundown of the roster. Goaltending: In Jonathon Quick the Kings have one of the youngest and most talented netminders in the NHL. The team smartly rewarded last year’s Conn Smythe winner with a ten-year $58 million dollar contract. Quick gives the club great stability and a player who should be a perennial Vezina Trophy candidate. 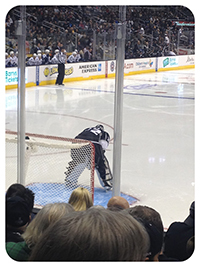 For insurance they have the very talented former first round draft pick Jonathan Bernier to back up Quick. If the team chooses to keep the talented Bernier they have an outstanding backup with a career 2.50 Goals Against. If they choose to trade Bernier they have a tremendous chip to bring instant help in others areas or talented prospects. It’s an excellent position to be in. Considering the quick start to the season and the potential for back to backs due to the shortened schedule the Kings may be smart to hold onto Bernier as an option at the trade deadline. Defense: Although seen as risky at the time the Jack Johnson trade turned out to be the right move and didn’t have an adverse effect on the club’s defensive core. Drew Doughty started slow following his contract dispute but still played a heavy volume of minutes and had a strong regular season. Doughty’s commanding playoff performance cemented his position as one of the top defensemen in the league and a future perennial Norris Trophy candidate. Rob Scuderi is a capable veteran and a sold partner for Doughty. In Willie Mitchell the Kings have a steady veteran along the lines of Scuderi. Mitchell teamed up well with Slava Voynov last year and they should again be a consistent second unit behind Doughty/Scuderi. With everyone back there’s no reason Quick and the defensive corps shouldn’t continue to lead a club near the top of the NHL in goals against. Forwards: Make no mistake the defense and goaltending carried the Kings to the 8th playoff spot with the offense kicking in during the playoffs. After a fairly pedestrian regular season the line of Anze Kopitar, Dustin Brown and Justin Williams exploded in the postseason with Williams scoring twenty points in twenty games. Due to injury the club will be without Kopitar for three to four weeks to start the season. The more high profile but less productive line of Mike Richards, Jeff Carter and Dustin Penner could be in for a big season. Richards had an up and down regular season but has been a consistent 75 to 80 point scorer during his career. He flourished in tandem with Carter in the playoffs and there’s no reason that can’t continue. For all his talent and sheer size and athleticism Dustin Penner has been an enigma during the regular season. If his strong playoff performance can carry on into the regular season the Richards line has the ability to be elite. The third line Jarrett Stoll, Trevor Lewis and Simon Gagne is a nice mix of young talent and veteran leadership. Prediction: Typically a championship team with every player back is the bonafide preseason favorite to repeat. So the big question: are the Kings a legitimate power that will continue their ascent or did they capture lightning in a bottle? A lot of things went right for the club in the postseason. Quick is an elite goaltender but it’s hard to imagine him repeating his utter dominance of last season. And can the Kopitar line continue to produce like they did in the playoffs? The rapid fire season will be a test of the Kings depth and resolve. They are equipped for the long haul and should be a contender for a top three spot in the west. Come playoff time, anything can happen. Barry’s Ticket Service is an official Partner of the Los Angeles Kings and carries Kings Tickets for all Home and Away Games. THE STORY: The Calgary Flames have been earning points at every turn as they claw their way toward a playoff spot in the Western Conference. Meanwhile, the Los Angeles Kings, who host the Flames on Saturday, have struggled to score and are in danger of landing on the wrong side of the postseason bubble. Calgary, which trails Los Angeles by two points for eighth place in the West, is 4-0-3 in its last seven overall games and 3-0-4 in seven on the road. The Kings have dropped five of seven and scored a total of seven goals in their last eight losses. ABOUT THE FLAMES (27-22-9): Despite notching a point in seven straight road games, Calgary has lost nine of its last 12 away from home. The Flames have dropped 20 of their last 27 meetings with Pacific Division teams. The line of captain Jarome Iginla, Olli Jokinen and Alex Tanguay has registered 13 goals and 27 points in seven games as a unit. Jokinen has recorded at least one point in seven of his last eight contests. ABOUT THE KINGS (27-20-11): Los Angeles has scored one goal or less in five of its last seven games and 11 of 19 in 2012. It also has had difficulty finding the net against Calgary, recording two goals or fewer in eight of the last 10 matchups. Mike Richards enters with a 13-game goal-scoring drought. He has just one tally in 23 contests, with that goal coming against Calgary on Jan. 14. Defenseman Davis Drewiske played in Thursday’s loss to Phoenix Coyotes, his first appearance since Darryl Sutter took over as coach in late December. Drewiske had been a healthy scratch for the previous 24 games. 1. The Kings have been involved in six 1-0 games this season, losing four – including two this month. 2. The teams have had opposite results on Saturdays recently as Calgary has won six of seven on the day and Los Angeles has lost nine of 11. 3. Darryl and Brent Sutter are squaring off for the third time this season. Darryl’s Kings have outscored Brent’s Flames 5-2 while going 1-0-1. PREDICTION: Flames 3, Kings 2. 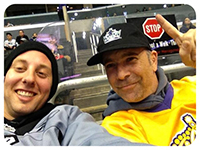 Congradulations to Mike Tumian he won a pair of Free Kings Tickets for tonights game. Looking for Kings Tickets? We stock all Kings home and away games. over the Dallas Stars on Sunday. an empty net to help the Kings go 2-3-1 on their trip. goal in as many nights. first goal in 10 games. turnover behind the net to start the play. Coyotes Vs Kings Tickets today. THE STORY: The Los Angeles Kings will continue their six-game road trip when they face off against the Florida Panthers on Thursday. Los Angeles is just 1-2-0 on its trek but has won three of its last five games. The Kings have owned the Panthers of late, winning seven straight overall meetings and three in a row in Florida. The Panthers, who haven’t beaten Los Angeles at home since Oct. 26, 2001, are 2-0-2 in their last four at the Bank Atlantic Center. However, they have lost nine of 13 overall. ABOUT THE KINGS (26-18-10): Mike Richards appeared to be as good as ever in his return from a concussion in December, scoring a goal in each of his first two games back. But the center has tallied just once in 19 contests since. Richards insists health has nothing to do with his struggles. “I feel good out there,” he said. “That’s what is frustrating. When you’re feeling good on the ice, you think that good things should come from it. It’s frustrating when you work so hard and get nothing from it.” Despite ranking just 21st in the league on the power play, Los Angeles has excelled with the extra man of late, going 10 for 37 over its last 12 games. ABOUT THE PANTHERS (24-17-11): Florida fell significantly in the Eastern Conference standings when it lost to Washington on Tuesday. The Capitals moved one point ahead of the Panthers for first place in the Southeast Division and third in the conference. Florida dropped from third to ninth, two points behind Ottawa for the final playoff spot. Jose Theodore could return from his knee injury Thursday. The goaltender has not played since Jan. 20 and has made only two starts since Dec. 31. Marco Sturm is expected to miss another month after undergoing knee surgery Monday. Sturm played in his first game since Dec. 20 last Wednesday against Washington but hurt his knee in that contest. You can still purchase Panthers Vs Kings Tickets for tonight. We stock Kings Tickets for all home and away games.